Lightweight serum reduces brown spots from breakouts and makes pores less visible. Our lightest serum perfect for oily skin. Ideal for combination to oily skin, this ultra-light serum delivers potent antioxidants and skin-restoring ingredients to help prevent the signs of ageing. Hyaluronic acid hydrates skin while niacinamide minimises pore size and fades post breakout marks. Skin is left smooth, firm and radiant. Apply morning and/or nighttime as desired. After cleansing, toning, and exfoliating, smooth a few drops onto face, neck and eye area. May be applied under or over moisturiser. For daytime, always follow with a moisturiser containing a broad-spectrum sunscreen rated SPF 30 or greater. Skins feels great after using this it's light, soothing, non greasy. Just leaves skin soft and smooth. Just what I need. With using some other Resist products, my skin is noticeably nicer, pores much less visible. I'm very happy. I really wanted to like this product but unfortunately it is not for me. This made my combo/oily skin on occasion very dry, to the point where skin would flake. Did not provide any brightening benefits, if anything really dulled my skin. Would return if I could. Biene - Amazing texture and finish! My skin is being a total pain at the moment. The weather has turned colder now and the easy to manage skin of the warmer months is a thing of the past. Almost overnight my T Zone is at its oiliest EVER and everywhere else is like a shrivelled prune and feels permanently 'tight'. I've been finishing off various really good serums and treatments and needed a good all round serum to replace them and after much research decided on this: although I need moisture I prefer to layer with lighter products and I want ingredients to help keep spots at bay and help with enlarged pores and I use a retinol product on alternate evenings. I received the serum today and have literally just applied it about half an hour ago but I am so impressed I felt moved to report my feelings immediately! This has such a lovely texture; not too runny and easy to apply. Most of all I am amazed by how moisturising it is - without feeling oily or tacky - just instantly replenishing and as I type I still haven't felt the need to apply my night creams (not even my eye cream). This is a lovely, lovely, lovely serum and which I think would suit most skin types. This is the best serum I have found - and I have tried a few! The consistency is thickish but it sinks right into the skin - it doesn't leave any residue. Leaves my skin feeling soft and also refreshed. I have been using it for about 6 months now and I feel it has definitely made my skin smoother and brighter looking - even reduced the wrinkles around my eye area. I heartily recommend. I do have fairly dry skin, but since I use other products (such as the clinical moisturizer) for that, I didn't want a heavy serum as well. I like this one a lot. It's very soothing, absorbs without any noticeable residue or greasiness. My skin feels very soft and hydrated. Definitely recommend. Leaves Skin Soft and very smooth and stops me being prone to breakouts. has great ingredients but the skin balancing does have retinol which makes me more tempted to purchase. Skin does feel hydrated and I like how its the only one with a water like texture, absorbs very quickly though which means I have to use more product to get full coverage so it may not last as long as the others.Since it yellow though, I do wonder if that makes the vitamin C has oxidized or whether something else makes it that colour? Would recommend this product even though it's on the pricey side. I have acne prone skin and don't tend to use serum or moisturisers due to oily skin. I gave it a try as my cleanser, toner and BHA 2% has worked for me and I am glad I did it has gave me a nice glow and my pores do not seem visible as they used to it's a wonderful product knowing that I am adding good ingredients to my skin. It's a bit on the runny side so need to be careful when using the product it has a yellowish colour to it but it the colour disappears into the skin, you only need a small amount of serum. I have been using this for two weeks and notice improvement to my skin and still no breakouts. Will be ordering again. Amanda - Know when you're beat! Okay, I can admit when I'm wrong! I wasn't sure about the first trial size of this so didn't reorder. Then I noticed my pores again and that's never a good sign people! I realised that when using this my pores were less attention seeking and that my face was less oily when I used this during the day, I use a different serum at night. Bought another trial size and a week or so into it, I have ordered the full size of this product. If you want less visible pores and less shine in all the right places (a shiny nose and chin is never going to be mistaken for dewy or glowing!) then give this a try. Use in conjunction with the 2% BHA pore refining treatment, your pores and shine will be even less. PS:Initially using this and the BHA pore refining made my cheeks peel. Some products do take time to adjust to, maybe even two trial sizes worth, but I adjusted and even use the 1% retinol as well. It did take around 2-3 months to adjust to all the new products but it was time well spent. Yeah, not so sure about this one, which I only had in the trial size. Have to say, a little of all these PC products goes a long way, so this sample lasted over 2 weeks despite being used twice a day. I bought this with other products and all of which were newbies to me, some I loved and reordered, some I liked enough to try a variant of and some I wasn't sure about so did not reorder. This falls into the last category, in addition something I used reacted and caused my eyes to swell. Having used all new products I couldn't weed out the culprit, that and being underwhelmed with this product made me give this a miss. Gotta give a big "WOOHOO!" to customer service who promptly answer emails and dispense advice for free! I contacted them before my first order for help deciding what to purchase and then when my eyes began to swell. PC, great products, great customer service, great return policy (never used but the offer is to return products that don't work for you within 30 days) and awful delivery. Nearly a full house of greatness! I bought the whole range as I was very pleased with the Resist Anti-Aging Multi-Correction Treatment Azelaic Acid. However the serum gave a yellow appearance, was very light in texture and dried my skin! I don't have terribly dry skin but this gave me dry patches and flaky skin. Also the moisturiser didn't improve my skin texture as it too was very drying. thank you for sharing your experience with us. We're sorry the Resist Anti-Aging Ultra-Light Super Antioxidant Concentrate Serum wasn't a fit for you! Be sure to contact our Customer Care for assistance. Okay, so for the past couple months I had been using the Skin Balancing Antioxidant Serum which I absolutely loved. At the time I was just easing into a completely new skin care routine consisting of nothing but PC products, & I went from oily blemished skin to a such normalized, flawless complexion... - after 2 months of flawless, blemish-free skin, I began to feel a tightness, & whether it was due to the Skin Balancing Antioxidant Serum on my normalised complexion or just the combination I had been using, or even another product, I chose to take out my Skin Balancing Antioxidant Serum & switch it for something a little more moisturizing. I didn't need the retinol since I was already on the 1% Clinical Retinol by PC anyway. My initial thoughts on using this serum were not so great because I immediately noticed a difference in the consistency; the name is 'ultra-light' which you could definitely say for the Skin Balancing Antioxidant Serum I had been using, because it felt lighter than air! It was a gel formula... this one isn't. It's watery & I immediately thought this once could potentially break me out... However! I was wrong & I've been using it more & more regularly to a point where I'm using it day & night for the past 2 weeks without any irritation, breakouts, oiliness or a dry/flaky/tight feeling. It's very comfortiing & absorbs, leaving me with smooth skin & a nice sheen without any heavy, sticky feeling whatsoever. It's super easy to distribute over the face without any tugging. This one is great for normal to dry skin. & I'm here to finally purchase a full tube! love the ingredients in this. You can't go wrong. Love this serum, alternate it with the skin balance serum so im still getting some retinol & my skin is looking so good! One small point- i wish the caps on both these serums were slightly wider ( like the vit c one) i store them standing up and they are constantly being knocked over because they arent balanced with a wider base! This is the 1st review I've ever written but really wanted to share my experience with this serum. I've been using this for a couple of weeks and cannot believe the difference this has made! I have sensitive acne prone dehydrated skin and have spent a lot of money trying 'reputed' serums that have either exacerbated my problem skin or not made a visible difference. This serum has improved the plumpness of my skin and reduced the redness of acne scarring and seems to be preventing hormonal break outs. This really is a 'must' try and a serum that will always remain in my skincare routine!! I have sensitive acne prone skin, I wanted something to give my skin an antioxidant kick so I opted for this oil free version and I didn't want any retinol. Sadly it dried my skin out so badly, it was very strange, my whole face became flaky and dry after 2 days, I really don't understand which ingredients did this, but sadly for me, not good at all. Customer Care: Hello, and thank you for sharing your experience with us - we're sorry to hear this didn't work as expected for you! Please contact a member of our Customer Care team, who can assist you with a possible alternative. Sarah - Love this product!! This really is an ultra light serum! lightweight and glides onto the skin perfectly. A little goes a long way and it really sinks into the skin. I have oily/combination skin (prone to breakouts and allergic/eczema skin) so have to be very careful to hydrate my skin without clogging my pores. I chose this particular serum as I was looking for something that would add a boost to my regular moisturiser and help smooth my uneven skin tone (due to acne scarring) as well as help fight the war against wrinkles!! 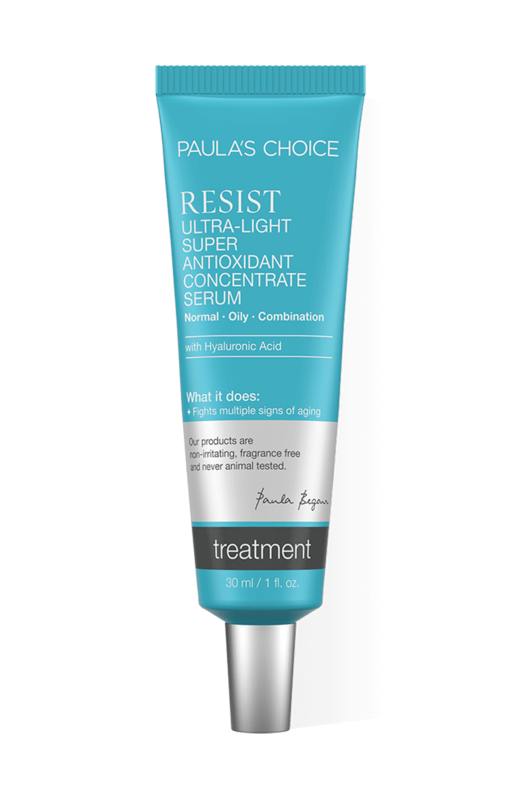 I use this with Paula's resist 2% BHA (both products morning and night) and have found the combination has really improved my skin tone and texture. Highly recommended product! Even though it's labelled 'ultra light' and for normal/ oily skin, it seems to caress my face and is immediately hydrating. Not quite sure about the longevity of that hydration though. Seem to sink in immediately as well. Since I followed it with Oily/ combination skin RESIST SPF 30 Moisturiser and now my skin feels quite taught so I can't workout whether the tautness is from the serum or the moisturiser. Must try sample again with another RESIST Normal/ Dry skin SPF moisturiser to work out if I could get on with this serum. I am a recent Paula's Choice convert! Initially I selected samples of all products suitable for combination skin. I was excited to try the serum collection, as I have never used one and found similar shop bought products just lie on my skin and cause more oil. I initailly watched (and highly recommend)the Youtube video on Paula's serums, "How Paula’s Choice Antioxidant Serums Work" which puts the serums into lightest to heaviest order and tells you which concerns they are best for. I was eager to try the ultra light serum - it's water based (the only one that is) and contains lots of ingredients to fight ageing (it's got those antioxidants found in red grapes). Sounded perfect to me. I opened my packet and saw it was a thickish yellow liquid which felt quite light on my skin, and seemed to sink in well. I was able to wear it quite happily initially, however after a few minutes I felt an uncomfortable feeling around my eyes - especially my eyelids and low eye brow bone area. It almost felt like stinging, or even burning a little. I didn't think that was a good sign, so I washed my face and tried again. I had the same tingling/stinging feeling in the same places. I have since tried my last few samples again but faired no better. I had only bought a handful of packet samples though so I don't mind. I am sure it will suit a lot of people as it's so light, but sadly it's just not for me. I use this in conjunction with the other resist serum - I wouldn't hesitate to use this even on areas where I was breaking out. The water based consistency feels super light - maybe too light for the dry areas on my combination skin, but perfect for the oilier area eg chin. Feels soothing and satisfying. Great serum! Does not leave you face sticky or oily, and if you put it on in the evening - your face is calm and glowy in the morning. I use this morning/evening, great if you want an extra boost for your skin! This product really is excellent! I have oily/combination skin with blackheads but I get dry patches on my cheeks and around my eyes during the colder months, which persist even with a full 3 step skin care regime. This serum is the perfect solution, it even gets rid of those horrible flaky bits you get around your nose when you have a cold! I tend to use a few drops after cleansing and toning at night, and then apply moisturiser afterwards. My skin is always smoother and more radiant in the morning, with no increase in oiliness or blackheads. It also works well with the BHA 2% liquid - I find it eliminates any dryness caused by the BHA without restricting its effectiveness. I just wrote a long review about the BHA 1% Gel but this product needs a mention as well. I am a 29 year old male who has always had spots and blackheads but has never done anything about it. After contacting the customer service team they recommended the BHA 1% gel and this antioxidant serum. I had been using some samples of the BHA 1% and had noticed a real improvement in my skin, but this product is the magic ingredient, since it reduced all the redness, especially around the blackheads on my nose. After literally a couple of days of use, I now have the best, smoothest, most even-toned skin I have ever had, and it is all down to these two products (and a bit of moisturiser as well). I was worried about the yellow tint that people had mentioned, but honestly haven't noticed it, especially since I only use this product at night before bed. I am blown away by the results and I can't believe it has taken me so long to fix my skin, especially considering how easy it has been to use. My confidence is through the roof now and I haven't had a spot or redness for weeks - something I never thought possible! I will be a customer for life. First of all, I have researched and tried other PC products. The pore reducing cleanser and toner are absolutely amazing, the best products I've used for my very oily skin. However this serum really disappointed me; I was looking for an alternative for moisturiser since they tend to make my skin greasier. I have used it for a few weeks, consciously applying it after step 1&2, every morning. That was until my friends told me I must have changed something in my skincare routine because my face was all irritated. I couldn't believe it; I so desperately wanted this to work but my face was covered in red tiny spots. My irritation stopped once I left the serum untouched. It is a shame really, the texture is great, doesn't leave any greasy film, but it must have some bad ingredients in it. Disappointed. Customer Care: Thank you for your review. We are sorry to hear of your experience with this product. While this response is not typical, we do understand that each customer is uniquely different in how they will respond to products or ingredients. We will send you some samples of other antioxidant serums to try out if these are more suitable for your skin. To it's claims, it fades red marks and makes skin healthy and even toned, I love it's water light texture and how it sinks in to my skin beautifully, excellent for oily skin, it helps to reduce redness from breakouts too. Alina - Great product that could give a slight tan or conceal the redness a bit. So let to me tell you a bit about my face and then I'll tell you why I rate this product 5 stars. Very dry skin, sensitive and rosacea on my cheeks and nose. My morning routine starts with gentle cleanser, the Skin Recovery Toner (which I noticed really moisturizes my skin and makes it soft, doesn't irritate it), then I use this serum and then my SPF 30. I bought this serum that is water based even though I have dry skin. Why? Because the other Resist Serum with retinol is a bit more "heavy/sheer/oily" and I'd prefer to use it at night. The ultra light one however, doesn't leave the shinny effect and absorbs immediately leaving the skin soft but mat - thing that i find it perfect for summer. Nno shininess, no stinging, and I saw good results almost instantly. I've been using this serum with the resist moisturiser for a couple of weeks now and am really disappointed with the results. It goes on nice and smoothy but when paired with the moisturiser as well my skin has become very, very dry (previously unheard of as my skin is usally very oily!) When applying make up after using these products it just cakes immediately on my skin and won't rub in like it used to. It leaves my pores looking very noticeable. Overall, I expected better things, but am better off sticking to my old routine. Customer Care: Thank you for your review. We are sorry to hear of your experience and will contact you by email. I bought samples to last me 2 weeks and have found yellowing of my skin even when applied in smaller amounts. Even after applying my moisturiser I get yellow patches mostly on neck and around hairline. Will try to use more sparingly. Happy with texture and results. Will go for skin balancing concentrate now I have tried both for extended periods. Love what Paula's choice products do for my complexion. Even my friends say my skin is amazing and I'm glowing. I wish they would try them too, just not that into their skincare that much. Their loss I say. I hate to say 'I told you so' in 10-15 years... I will continue to evangelise about PC. Hopefully it will sink in before it's too late for them to reap the benefits. Very effective skin-restoring ingredient that can visibly improve the appearance of enlarged pores, uneven skin tone, fine lines and dullness. Bioflavonoid ingredient from plants that functions as an antioxidant, skin-soothing agent, and restorative ingredient. Component of skin tissue. A superior skin-replenishing ingredient that can boost skin’s moisture content, soothe, and defend against moisture loss. 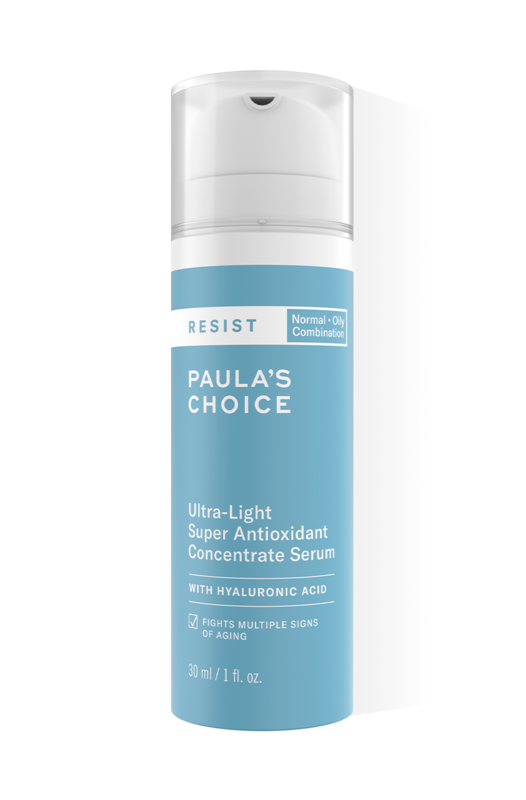 How does Resist Ultra-Light Super Antioxidant Concentrate Serum differ from the other Antioxidant Concentrates that Paula's Choice offers? Resist Ultra-Light Super Antioxidant Concentrate Serum is our only water-based serum (our other serums are silicone-based), and it is the lightest serum in the Resist line. Its blend of potent antioxidants, skin-repairing, and cell-communicating ingredients help fight multiple signs of ageing without feeling slick, greasy, or heavy on combination to oily skin. Because oily skin tends to also have enlarged pores, this serum was formulated with ingredients that help normalise pore function. It also contains anti-irritants which reduce redness from acne and acne marks. This serum is one of two Paula offers that does not contain retinol. Some people with oily skin cannot tolerate retinol, making Resist Ultra-Light Super Antioxidant Concentrate Serum a great alternative. Every Paula's Choice serum contains an effective blend of antioxidants, skin-repairing ingredients, and cell-communicating ingredients to restore skin and significantly reduce wrinkles, increase collagen production, and improve skin tone. You will be getting anti-ageing benefits regardless of which one you choose! Select the best serum for you based on your skin type and chief concerns, plus texture preference. Can Resist Ultra-Light Super Antioxidant Concentrate Serum be used around the eyes? Yes Resist Ultra-Light Super Antioxidant Concentrate Serum be used around the eyes. All Paula’s Choice serums as well as our moisturisers can and should be applied around the eyes. The same statement also applies to the neck and chest, two areas prone to showing signs of sun damage and ageing. Is Resist Ultra-Light Super Antioxidant Serum suitable for those with rosacea-prone skin? Resist Ultra-Light Super Antioxidant Concentrate Serum is ideal if you have rosacea-prone skin plus oily skin or oily areas. The antioxidants and anti-irritants in this serum are wonderfully soothing for rosacea-affected skin. Creamy foaming face wash will leave skin feeling refreshed, soft and smooth. Super-light, anti-ageing toner prevents signs of ageing and refines pores. Ultra-light exfoliant improves visible signs of ageing and refines pores for radiant skin. Weightless lotion texture protects skin from the sun and leaves a soft matte finish. 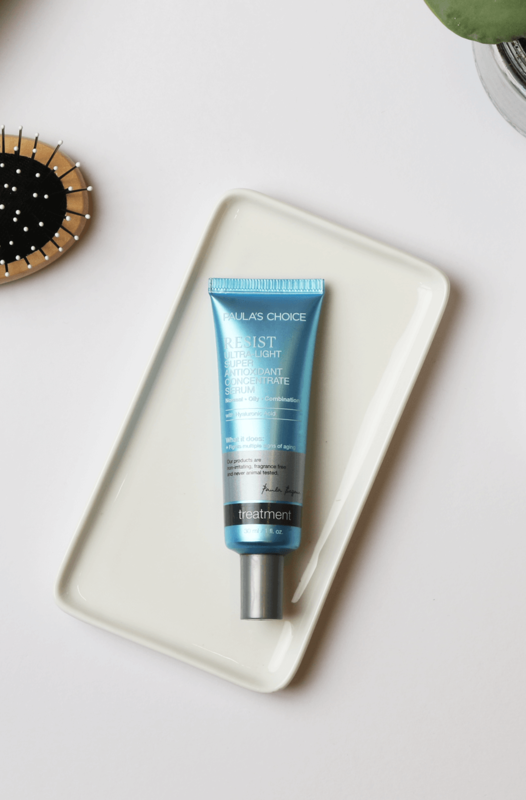 Our Resist Anti-Aging Moisturiser SPF 50 has got a new look! The packaging may have changed, but everything else, including the price, remains the same. Advanced anti-ageing moisturiser for oily skin smooths fine lines and reduces blackheads. Sign up for our newsletter to receive exclusive offers and expert skincare advice, plus get £5 off your next order.